Well, if I were you, I'd head down to Somerset, and the town of Weston-super-Mare. OK, ok, ok. Calm down. Anyway, this is a bit of a mystery. Well, it's known from a single map extract, an RAC map from the mid-1970s, which in itself is a little unusual, though not unheard of. There are seemingly no references to this motorway other than this map - though I suspect it would help if we knew what it was actually called! 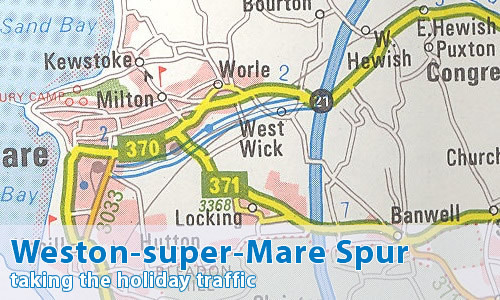 "Weston-super-Mare Spur" is simply a description, not anything official. There's nothing yet discovered in either the Somerset County Archives, or the National Archives. In fact, in most cases I'd suggest that it was nothing more than an error on the part of the mapmakers. There are several rather strange co-incidences around this area that make us think that perhaps there might just be something in it after all. In 1994, twenty years after that map was published, a new dual carriageway access road to Weston from the M5 was opened. At first glance, it appears to be a recycling of this mystery spur. However, when you look closely it isn't the same road at all. The new road passes to the south of West Wick, whilst the map of the motorway shows it clearly passing to the north of the village. The constructed road also twists and turns at roundabouts in the way that the motorway map just doesn't, and the motorway runs parallel to the railway line into Weston, whereas the new A370 stays well to the south. Oddly, the two routes meet up again - right on the terminus of the motorway! Granted, the motorway map isn't at the greatest of scales, but there still seems to be a fair amount of the route that is still gaps in the built-up area, whilst the rest is modern housing estates and a "tin shed" industrial estate. It's all very interesting speculation, but it's hardly a "smoking gun", is it? No, it certainly isn't. It's very possible that we might be adding 2 and 2 and getting 342 and a half. Once again, we suggest that you look at the evidence and make up your own mind. Is it for real, or is it a mapping error? For my sins I live in Weston-super-Mare and can remember, albeit vaguely, the 1994 road being built. Something must have been proposed here when the M5 was built around 1973 because, more obviously on the ground is the only grade separation on this road which is the bridge immediately after the junction. This is contemporary to the junction and is certainly wide enough to accommodate a couple of hard shoulders. This sat for 20 years carrying the A370 over the top of, well, not a lot with the slip roads pretty much as they are now. The gap in the carriageways is forced from the level of the ground I'm afraid where the eastbound carriageway has to raise to reach the on slip. This is in fact a major bottleneck in rush hour and numerous conversations have been had in the press about coming up with a solution, from relocating junction 21, building a 21a further south with the A371, or North Somerset's usual approach of doing nothing. On the M5 south offslip, if you look at the aerial photo you will see that it crosses the railway, had it been built 'normally', as a mirror of the northbound on slip it would have been far shorter, therefore no need to bridge the railway. The spur would have fed onto the M5 northbound, it is known that the central reservation between J20 and J21 is futureproofed to allow a fourth lane. This would have led to a route from the peculiarly aligned roundabout at J20 to tie in with the Long Ashton bypass into Bristol. A forum discussion on SABRE had a link to a Geotechnical website with a map of logged boreholes in the UK, this showed clearly the investigative work carried out between J20 and Long Ashton. At the Weston end there was no such evidence except for a straight line extension eastwards from Herluin Way, but labelled as Weston Main Drain. Herluin Way was built as S2 in the early 1980s in preparation for dualling later, it is the dead straight bit past the sports centre and waste ground. Maybe the sewerage pipe forced the different alignment of the 1994 road? Heading out of Weston the drive round the roundabout onto the railway bridge is quite a turn for a main road, I can't imagine this being planned, more likely the newer bit was plugged into an existing plan. Further into Weston where route splits around a retail park. Winterstoke Road (outbound) has been there since the year dot, originally as a short railway into the town as a separate line from the mainline, and then as Gasworks lane after the current railway station was built. Marchfields Way (inbound) was built mid to late 1980s with futureproofing space to dual. This is actually being currently discussed as an option to improve traffic flow. Beyond that I'm not sure what would have happened any differently to what was built, except the original scheme must have been grade separated, as was in vogue. I can only suggest the new alignment was forced from change in road building policy over twenty years. The idea of development along the initial proposed route forcing a revised alignment is dashed as much of the housing south of the railway between the M5 and Herluin Way is from the 1990s onwards, in fact parts are still being built today. That said, if there was any firm route surely it would have been protected anyway. The open space adjacent to the railway line is the route of a main power line, I'm sure this land would have been built on too otherwise! Hope that gives you bit of insight. I can get some photos of the bridge or other bits if you wish. I have been meaning to visit the local library for some time in the hope of discovering something about this little mystery. I certainly think there is more to it than a mapping error. In the early nineties i lived in WSM and my first job was on the building of Worle Parkway office park next to Worle Parkway Station. The railway station was built at the same time. I was told that the plan had been to build a big railway station at Worle which would replace Weston Milton and Weston Station, and the new road would follow the railway spur that loops in and out of Weston. Passengers would get off at Worle and catch a bus into town. But for what ever reason, only a local station was built, not one that could take HST's and the railway loop stayed. I guess that the road from the motorway to Herluin Way had to fit in. I don't remember it ever being referred to as motorway though, it would have always been the A370.